Photo Courtesy of U.S. Geological Survey (Department of the Interior), photo by Leslie Dierauf. The Salish, Southern Puget are a Native American people reside in and around the Puget Sound Basin in Washington state, near and just north of Seattle. 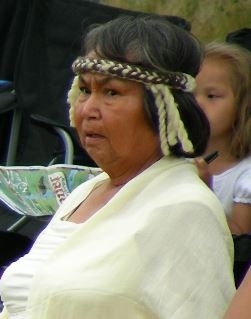 Most contemporary Southern Puget Salish Indians live on local reservations or in nearby cities and towns. Historically, the Southern Puget Salish refers to over 50 named, autonomous Indian groups or tribes inhabiting the Puget Sound region and speaking one of two languages. However, now the majority of the people speak English. In fact, their mother tongue, Southern Puget Salish, is nearly extinct. They are mixed religiously with some being Roman Catholic, others being Protestant Christians, and others practicing traditional beliefs such as consulting shamans; and traditional dances, music, and ceremonials, particularly pertaining to funerals, spirit powers, and the giving of inherited Indian names. In addition, some are not phased on a daily basis with an religious preferences. Pray evangelical Southern Puget Salish will boldly and unashamedly share via words and deeds the message of hope found in Jesus Christ. Pray Christians will develop close friendships with Southern Puget Salish revealing to them how Christ is intimate and has made a difference in how they see life. Pray Christians will gather where Southern Puget Salish gather, building bridges that allow the gospel to cross.